The State’s Attorney for the Judicial District of Danbury is charged, pursuant to Article IV, Section 27 of the Constitution of the State of Connecticut and Connecticut General Statutes (C.G.S.) Sec. 51-276 et seq., with the investigation and prosecution of all criminal offenses occurring within the Judicial District of Danbury. The Connecticut State Police have the responsibility to prevent and detect violations of the law and this State’s Attorney has worked with and relied upon the Connecticut State Police since the incident occurred. Since December 14, 2012, the Connecticut State Police and the State’s Attorney’s Office have worked with the federal authorities sharing responsibilities for various aspects of this investigation. Numerous other municipal, state and federal agencies assisted in the investigation. The investigation materials reflect thousands of law enforcement and prosecutor hours. Apart from physical evidence, the materials consist of more than seven-hundred individual files that include reports, statements, interviews, videos, laboratory tests and results, photographs, diagrams, search warrants and returns, as well as evaluations of those items. In the course of the investigation, both state and federal law enforcement personnel received a large number of contacts purporting to provide information on the shootings and the shooter. Although many times these “leads” would go nowhere, each one was evaluated and often required substantial law enforcement time to pursue. An abundance of caution was used during the investigation to ensure that all leads were looked into, despite the fact that more than 40 such “leads” proved, after investigation, to be unsubstantiated. Information that was substantiated and relevant was made part of the investigation. 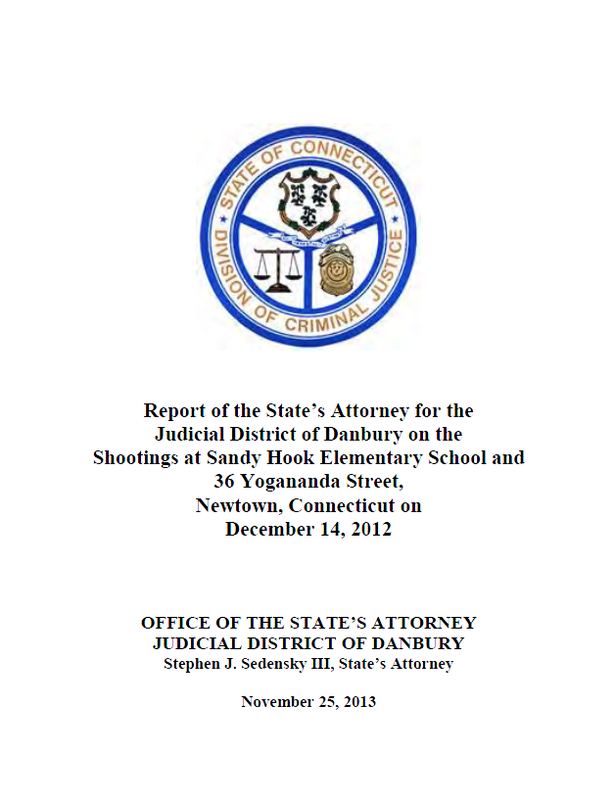 It is not the intent of this report to convey every piece of information contained in the voluminous investigation materials developed by the Connecticut State Police and other law enforcement agencies, but to provide information relevant to the purposes of this report. While no report is statutorily required of the State’s Attorney once an investigation is complete, it has been the practice of State’s Attorneys to issue reports on criminal investigations where there is no arrest and prosecution if the State’s Attorney determines that some type of public statement is necessary. Given the gravity of the crimes committed on December 14, 2012, a report is in order. On the morning of December 14, 2012, the shooter, age 20, heavily armed, went to Sandy Hook Elementary School (SHES) in Newtown, where he shot his way into the locked school building with a Bushmaster Model XM15-E2S rifle. He then shot and killed the principal and school psychologist as they were in the north hallway of the school responding to the noise of the shooter coming into the school. The shooter also shot and injured two other staff members who were also in the hallway. The shooter then went into the main office, apparently did not see the staff who were hiding there, and returned to the hallway. After leaving the main office, the shooter then went down the same hallway in which he had just killed two people and entered first grade classrooms 8 and 10, the order in which is unknown. While in those rooms he killed the two adults in each room, fifteen children in classroom 8 and five in classroom 10. All of the killings were done with the Bushmaster rifle. He then took his own life with a single shot from a Glock 20, 10 mm pistol in classroom 10. Prior to going to the school, the shooter used a .22 caliber Savage Mark II rifle to shoot and kill his mother in her bed at the home where they lived at 36 Yogananda Street in Newtown. The response to these crimes began unfolding at 9:35:39 a.m. when the first 911 call was received by the Newtown Police Department. With the receipt of that call, the dispatching and the arrival of the police, the law enforcement response to the shootings began. It was fewer than four minutes from the time the first 911 call was received until the first police officer arrived at the school. It was fewer than five minutes from the first 911 call, and one minute after the arrival of the first officer, that the shooter killed himself. It was fewer than six minutes from the time the first police officer arrived on SHES property to the time the first police officer entered the school building. In fewer than 11 minutes twenty first-grade pupils and six adults had lost their lives. The following weapons were recovered in the course of this investigation: (1) a Bushmaster Model XM15-E2S semi-automatic rifle, found in the same classroom as the shooter’s body. All of the 5.56 mm shell casings from the school that were tested were found to have been fired from this rifle. (2) a Glock 20, 10 mm semi-automatic pistol found near the shooter’s body and determined to have been the source of the self-inflicted gunshot wound by which he took his own life. (3) a Sig Sauer P226, 9 mm semi-automatic pistol found on the shooter’s person. There is no evidence this weapon had been fired. (4) a Izhmash Saiga-12, 12 gauge semi-automatic shotgun found in the shooter’s car in the parking lot outside the school, and which was secured in the vehicle’s trunk by police responding to the scene. There is no evidence this weapon had been fired. (5) a Savage Mark II rifle found at 36 Yogananda Street on the floor of the master bedroom near the bed where the body of the shooter’s mother was found. This rifle also was found to have fired the four bullets recovered during the autopsy of the shooter’s mother. All of the firearms were legally purchased by the shooter’s mother. Additionally, ammunition of the types found had been purchased by the mother in the past, and there is no evidence that the ammunition was purchased by anyone else, including the shooter. At the date of this writing, there is no evidence to suggest that anyone other than the shooter was aware of or involved in the planning and execution of the crimes that were committed on December 14, 2012, at Sandy Hook Elementary School and 36 Yogananda Street. From the time an unknown male was encountered by the Newtown police outside of the school during the initial response, until well after the staff and children had been evacuated, the thought that there may have been more than one shooter was a condition all responding law enforcement worked under as they cleared the school. Individuals located in the wooded areas surrounding the school as the searches and evacuations were taking place were initially treated as suspect and handled accordingly (including being handcuffed) until their identity could be determined. The circumstances surrounding all of these individuals were fully investigated and revealed no additional shooters. DNA testing of evidence recovered from both the school and 36 Yogananda Street also revealed no potential accessories or co-conspirators. It is the conclusion of this State’s Attorney that the shooter acted alone and was solely criminally responsible for his actions of that day. Moreover, none of the evidence developed to date demonstrates probable cause to believe that any other person conspired with the shooter to commit these crimes or aided and abetted him in doing so. Unless additional – and at this time unanticipated – evidence is developed, there will be no state criminal prosecution as result of these crimes. With the issuance of this report, the investigation is closed. Should additional reliable information related to the existence of accessories or co-conspirators come to the attention of the investigators, the investigation will be reopened. In the course of his rampage the shooter committed a number of crimes in violation of our Connecticut Penal Code. The most significant are those where lives were taken and people were physically injured. In Sandy Hook Elementary School, the crime of Murder under Special Circumstances, in violation of C.G.S. Sec. 53a-54b, was committed twenty-six times and Attempted Murder under Special Circumstances in violation of C.G.S. Secs. 53a-49 and 53a-54b was committed twice as it relates to the two individuals who were shot by the shooter and survived. The crime of Murder in violation of C.G.S. Sec. 53a-54 was committed by the shooter in killing his mother. The obvious question that remains is: “Why did the shooter murder twenty-seven people, including twenty children?” Unfortunately, that question may never be answered conclusively, despite the collection of extensive background information on the shooter through a multitude of interviews and other sources. The evidence clearly shows that the shooter planned his actions, including the taking of his own life, but there is no clear indication why he did so, or why he targeted Sandy Hook Elementary School. It is known that the shooter had significant mental health issues that affected his ability to live a normal life and to interact with others, even those to whom he should have been close. As an adult he did not recognize or help himself deal with those issues. What contribution this made to the shootings, if any, is unknown as those mental health professionals who saw him did not see anything that would have predicted his future behavior. He had a familiarity with and access to firearms and ammunition and an obsession with mass murders, in particular the April 1999 shootings at Columbine High School in Colorado. Investigators however, have not discovered any evidence that the shooter voiced or gave any indication to others that he intended to commit such a crime himself. This State’s Attorney expresses his sincere sympathy and condolences to the victims of the incident of December 14, 2012, and to their families. He also expresses his appreciation for their continued patience and understanding during the course of the investigation and preparation of this report. He acknowledges and thanks law enforcement, which responded to Sandy Hook Elementary School in minutes and entered the building believing someone could be there ready to take their lives as well. He also acknowledges and thanks the staff of the Sandy Hook Elementary School who acted heroically. The combination saved many children’s lives. This report would not have been possible if not for the assistance and cooperation of numerous agencies at the state, local and federal levels of government. The State’s Attorney expresses his sincere gratitude and appreciation to all of these agencies and to all of the men and women who contributed so much to this investigation. The assistance of federal authorities has been invaluable. Particularly worthy of special note are the men and women of the Connecticut State Police, and in particular, the Western District Major Crime Squad. The thoroughness and sensitivity with which they conducted their investigation is unmatched in my experience.